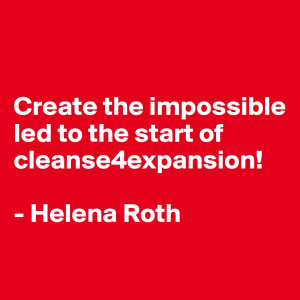 Create the impossible – cleanse4expansion! So, yesterday I started a new 90 day adventure! It was the official kick off date for the Create the impossible-class, and I kicked it off my launching a new blog: cleanse4expansion. I’m reflagging the initial post here, and will try to keep both blogs going with daily postings, without mixing them up too much. It would make me very happy if you helped to cheer me along as I try to create the impossible! When did you last try to create something impossible? What I intend to create, which certainly feels impossible, during the next 90 days, is to cleanse my physical and digital home, allowing for spiritual expansion. Det här inlägget postades i Okategoriserade av Helena Roth. Bokmärk permalänken.